Rowing eights coxswain Brian Price and Paralympics swimmer Stephanie Dixon both returned from Beijing with gold this summer. 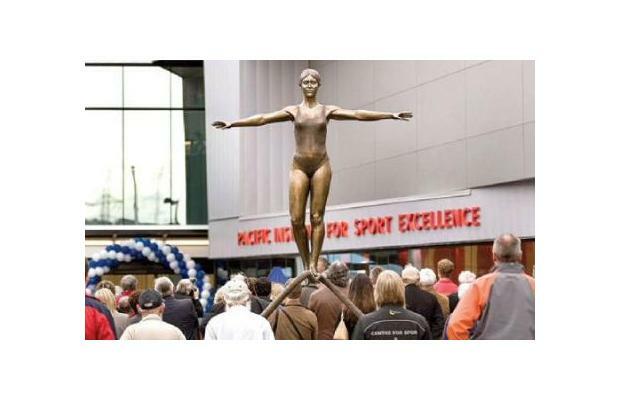 Yesterday they officially helped unveil the $28-million first phase of the Pacific Institute for Sport Excellence, from which future Olympians are expected to emerge. 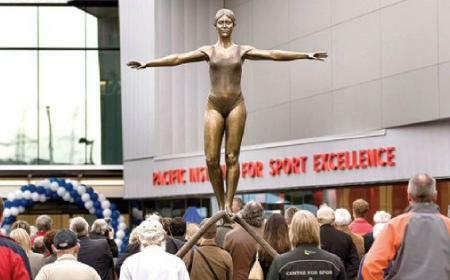 Price and Dixon pulled the cover from the $150,000 bronze statue Equilibrium, by local sculptor Armando Barbon, which greets athletes and visitors as they walk into the institute. "You hear rumours of what other nations are doing and of their institutes of sport and their sports sciences. Now we have our own," said Kyle Hamilton, the UVic law student who was the stroke for the 2008 Beijing Summer Olympics gold-medallist Canadian eight. "Whether you're summer, winter or Paralympics, it's an exciting time to be an athlete in Victoria. Without the support of these organizations here, our men's eight would not be the world and Olympic champions." The facility brings together in one place a myriad of training and workout areas, including a double gym and all-weather turf pitch, combined with cutting-edge sports science and sports medicine labs and is expected to boost Olympic and Camosun athletes on down to the grass roots. The institute is creating ripples beyond Victoria. Vanoc chief John Furlong was busy yesterday with matters pertaining to the 2010 Vancouver Winter Olympics but sent a message that was read at the opening. "If we get top national medal status in 2010, the Pacific Institute will have helped get us there," said Furlong. The public got their first look at the facility yesterday during an open house. Meanwhile, Victoria Olympians continue to revel in the post-Beijing glow with Adam Kreek and Malcolm Howard of the gold-medallist eight and silver-medallist triathlete Simon Whitfield to appear on tonight's Royal Canadian Air Farce show on CBC. The other athlete on the show will be Beijing silver-medallist kayaker Adam van Koeverden of Ontario. Asked if there were any nerves ahead of appearing on national television, Howard replied: "I can't be any more nervous than I was this summer at the start line of the Olympics." Howard said he hadn't seen a script before yesterday's taping so had no idea what skits awaited. "Maybe they will have Stephen Harper walk by and throw some spare change on the floor and we can all fight over it," quipped Howard. That withering statement -- Canadian Olympians have been chronically underfunded compared to those in many other comparable nations -- also cut close to home yesterday at the Pacific Institute opening. The planned second phase -- to include more sports science/medical labs, a third gym for international competitions and the completion of a four-lane IAAF-certified training track to encircle the turf field -- has been frustrated by a wait for federal funding.